Free Printable Multiplication Tables. Free Printable Multiplication Tables, a great resource to help students learn and remember the multiplication tables at school or homeschool. Parents and Educators can use the multiplication tables to cut out and share with students for easy multiplication table reference. Print the Multiplication Tables free using your home laser or inkjet printer, and give to kids at math classroom. Includes 4 multiplication tables from 0 to 12. 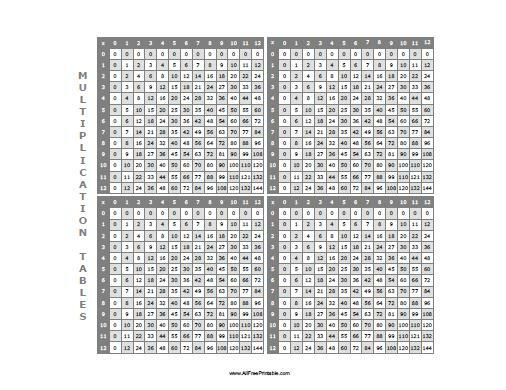 Click the link below to download or print the Multiplication Tables now in PDF format.